His way of drawing, I would say, hardly differs from one artist to the next. 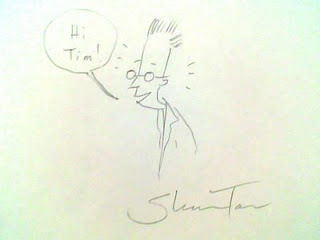 It was good to go the talk and actually hear him talk about his sketches and paintings. I think every artist should talk about their work a little more, how they integrate their inspiration and experiences into their art is terribly interesting to me and I think helpful for others. It was VERY reassuring to hear him talk about his work because it made me realize that I am handling things well enough, just because it feels right. Feeling good about your work, it probably more important than anything else. The talk from David Almond was just great as well, he makes writing sound so easy. Another down to earth person as well. His notebooks look like my sketchbooks, lots of writing in various places, lots of ideas floating about and somehow he manages to make something just great and pristine from the messy notebooks. Whenever you read a book, you'd think that a writer just sits down and literally just writes all the perfect verbs, adjectives, pronouns etc perfectly on paper, well not David Almond anyway! What I found particularly admirable from his talk is his experience with some agents. You'd think he'd just give up, but it's great that he didn't! ! ! Talking about my own work, I find it a little difficult because I have so many sources of inspiration and ideas, weird and crazy ideas, half ideas. It's strange in a way because having so much of this can work against me at times. I have that notion that every time I don't draw it either gets stored away or totally forgotten. Does anyone ever have this experience or feel like this? If so, what does one do about it? Sometimes what also stops me from drawing is that I feel my work isn't good at all....but I just do it because I have to...something needs to get out...good or bad.